Learn the process of using melting ice and dye powder to create uniquely patterned textiles. Two nights of fun and experimentation in my SE studio. No previous dye experience required. $75 includes all equipment and supplies. Each participant will leave with two one-of-a-kind ice dyed cotton bandanas. Space is limited. Send message via Contact page to register. 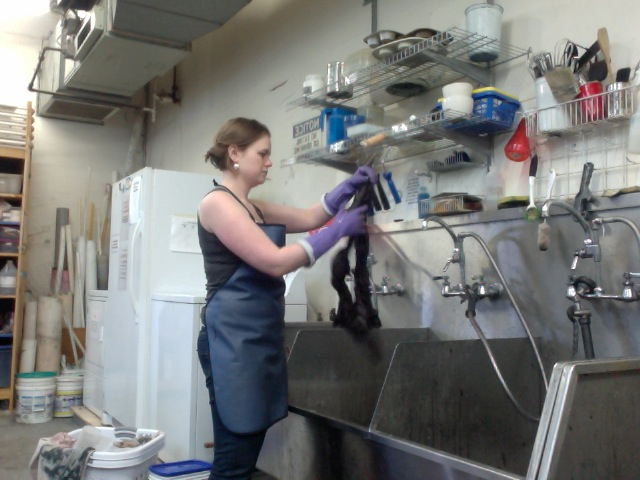 Sarah Laird is an artist working with dye and fabric in Portland, OR. She sells her one-of-a-kind fashions under Studio One O Eight. She was the recipient of the Juror's Choice Award in Coastal Fiberarts 2013. She has been recognized with an Outstanding Student Award from the Surface Design Association and has been a finalist in the Niche Awards. Commissions include a quilt for OCAC’s Art on the Vine Auction. She has shown at a variety of venues in Portland, Astoria, Corvallis and Pendleton, OR. She received her BFA from the Oregon College of Art and Craft in May 2013.